James Patterson presents: The Titans of the Toilet! The Wonders from Down Under! Nitro City's very own sewer superheroes: The Plumbers! Super Mario Bros meets Captain Underpants in this action-packed comedy sure to make a splash! Thirteen-year-old Sully Stringfellow has always admired the great plumber heroes of Nitro City. These wrench-wielding warriors guarded the sewers--until they were discredited by the powerful Ironwater Corporation, which has a sinister scheme to take over the city. Without the plumbers, Nitro is being overrun by mutant creatures--and things are about to go totally nuclear thanks to the potentially explosive 50th Anniversary Burrito Festival! It's up to Sully and a league of long-forgotten plumber heroes to save the day, making it safe for all to flush again. It's a dirty job, but someone's got to do it! 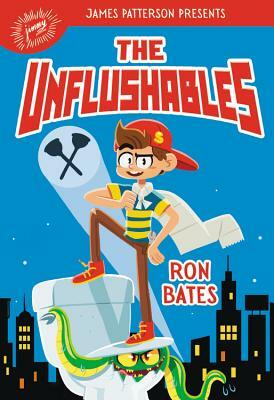 Ron Bates is a novelist and humor columnist who writes about secret laboratories, monsters, bullies, robots, cafeteria food, and other perils of middle school. A former newspaper reporter, he is the author of How to Make Friends and Monsters, How to Survive Middle School and Monster Bots, the comic book series Brawn, and numerous poems and plays for kids who like to laugh. He lives in Texas.